Does it seem like everything is moving so fast these days you can barely keep up? Do you sometimes feel that your life is spinning out of control? For many of us, life feels completely out of balance because we give one area of our lives too much attention and the other areas nowhere near enough. 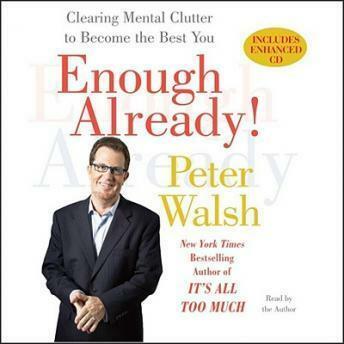 This crazy imbalance and the resulting stress and unhappiness you feel are the clutter that Peter Walsh wants to help you tackle in Enough Already! Peter examines the six key areas of your life -- Family, Relationships, Work, Health, Money, and Spirituality -- and shows how these unique parts are so interrelated that if just one is cluttered, that clutter will creep into the other areas and throw your life off balance. He then offers a step-by-step plan that helps you acknowledge and address the emotional and mental clutter that holds you back from living the richly fulfilling life you deserve. Peter is determined to help you change. With his wry humor, his constant encouragement, and the specific tips and practical advice he offers, Peter helps you prioritize what matters in your life. Then his straightforward approach shows you how to let go of the stress and clutter and regain your balance, focus, energy, and purpose. By following his simple plan you will finally be able to live the life that's been buried under all your emotional clutter for years and the one you've always imagined.